Taking off my helmet at a petrol station in Bolivia, I'm approached by a curious local and the inevitable first question, "Where are you from?" I enjoy their shocked reaction on hearing "India". I quickly add, "but, I started in the US", which doesn't really help reduce their bewilderment. Vanakam, I am Jay Kannaiyan and my roots are in Chennai, with a childhood spent in Zambia and Kodaikanal. I went to the US to pursue mechanical engineering, and after landing a comfortable corporate product design gig, I started pursuing my passion for two wheelers. I upgraded my college Suzuki GS500 to a brand new Suzuki GSX-R600 and right away got into touring. The GSX-R is by all means the 'wrong' bike for touring. But, it's the right bike for twisties and I pursued all the twisting tarmacs that I could find across the US and racked up 80,000km over four years on that gixxer. 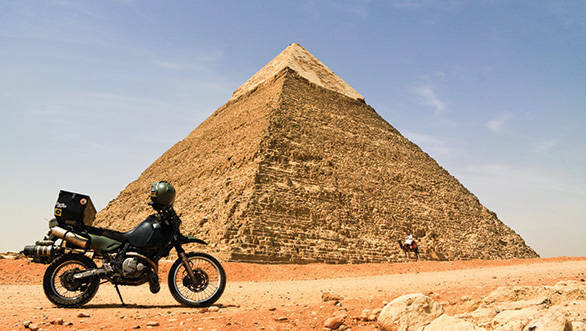 In that time, I became aware of the possibility of riding a motorcycle around the world. It was a dream; a dream that many others have dreamed. I started researching what it would take to make it come true. Firstly, there was the money aspect: how much was needed to live on the road? Secondly, there was the paperwork issue: would it be possible to travel with an Indian passport and get all the required visas? Thirdly, what bike was best-suited for such a journey? And then there were questions such as: what route to take, what kind of gear did I need and what to tell my parents? I didn't know when this dream would be realised, but I started saving up and learning about the life on the road by touring around the US. 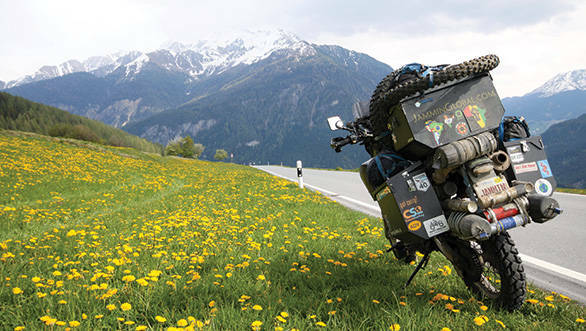 I gleaned knowledge by touring with other veteran bikers and had mechanics guide me through various maintenance procedures so that I could be self-sufficient on this journey. I realised that an enduro bike would be best for this kind of journey and got acquainted with the Suzuki DR650, a highly capable off-road bike that can handle the highway as well. I acquired camping gear and learned how to cook and stay healthy on the road. I found out that traveling on an Indian passport wouldn't be an issue, but I would have to time it perfectly with visas and their expiry dates. By now, it had dawned on me that leaving on such a trip would mean giving up my life in the US and my greencard application. However, I wanted to return to India, and I figured that this trip would be my transition from the US to India  a slow, overland transition through Latin America, Europe and Africa, through the Andes, Amazon and Sahara, and sailing across the Altlantic and Indian oceans. With everything falling into place, I sold my house and most other worldly possessions that I had in Chicago. And once I submitted my resignation letter, there was no turning back! 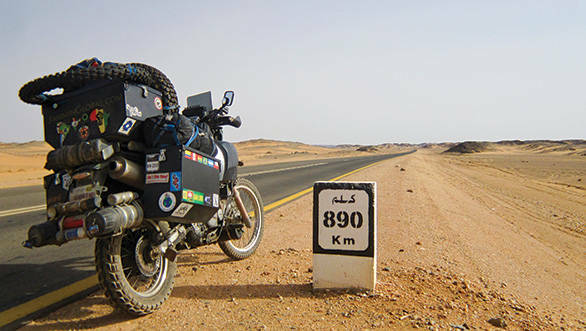 There were butterflies in my stomach on the night before departure, but on the morning of March 5, 2010, all doubt vanished as soon as I turned on the ignition of sanDRina, my DR650. Soon I was riding into the wind. It was not until I crossed the US border into Mexico that it sunk in that I was on a one way journey to India. I got through Central America before the hurricane season and had to sail from Panama to Colombia since there are no roads connecting the two continents. It felt grand to be arriving into Cartagena on a boat, a hark back to the old days of reaching a new continent by ship. There weren't going to be any plane travels. This was going to be one long journey. Colombia was a country that I was a little apprehensive about, given its reputation of being a hotbed of crime. But once there, I realised that I had nothing to worry about. I got in touch with the local biking community and they took care of me for my entire stay there. I realised that what's reported on the news is just a small slice of the ground reality. My father would warn me of every South American country that I was entering based on the news, and I told him that "Based on the news, India isn't a safe country either, Dad!" 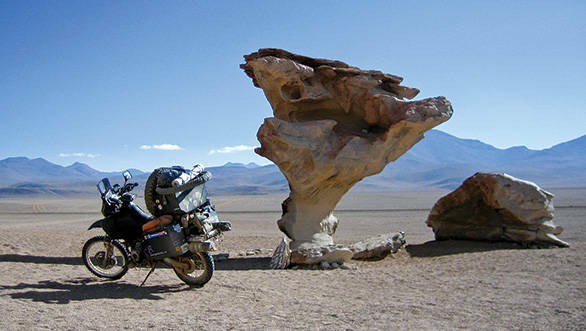 I enjoyed the ride down the mighty Andes and spent days riding across small dirt tracks in remote areas of Peru and Bolivia. 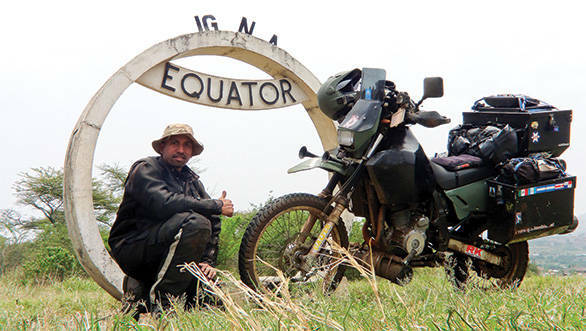 From there, I headed across the Amazon Rainforest and rode the 2,000km hard-mud track of the Rodovia Transamazonica. My reward for the jungle ride was an easy cruise down Brazil's coastline, meeting lots of friendly locals and learning to speak Portuguese. It's one of the countries that I'd want to return to and live in at some point. There's a good vibe there; the people are happy, the weather is nice and the beach is always nearby. I got back to the Andes and sojourned down Ruta 40 that traverses the length of Argentina, all the way down to Ushuaia, the southern tip of South America. In many places, I would be camping with not another human being around for a hundred kilometres, at least. I didn't feel lonely and felt more connected to the nature. From Buenos Aires, I bid adieu to the Americas and boarded a cargo ship for my voyage across the Atlantic. 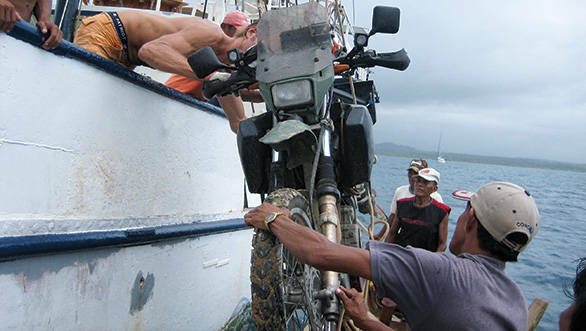 It was a car-carrying freighter, and they welcomed me and my Suzuki DR650. It was a 26-day journey across the ocean to Hamburg, Germany. 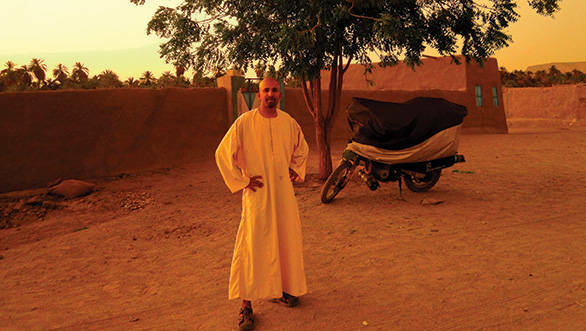 In Europe, my route plan changed as I was denied a visa for Morocco since I was not applying from my home country. So I decided to head down the East Africa route. I boarded a ferry from Venice, Italy, and crossed the Mediterranean Sea to Alexandria in Egypt. The timing was just perfect as I arrived in Egypt just three months after the 2011 Egyptian revolution. Luckily for me, most tourists were still scared to visit Egypt, which meant that I was just by myself inside the Great Pyramid. Then I left the Nile and sought solace by camping in the White Desert  the Sahara where giant limestone sculptures have been carved by the sand-borne wind into psychedelic shapes. Camping out there was a sublime experience. From Egypt, I crossed into Sudan and was once again surprised how the people were so different from how the news would have us believe. As strange as it sounds, but among the countries that I've been through, Sudan made me feel the safest. I was wild-camping by the Nile in northern Sudan and a group of fishermen invited me to join them, and I ended up spending five days with them, experiencing a bit of their life. I drank lots of mint tea to keep cool from the heat and ate fresh fish and sweet dates. After the deserts of the Sahara, the climb into Ethiopia was a welcome change. The Simien Mountains made for some great off-roading, which prepared me and SanDRina for the epic 900km off-road route from southern Ethiopia into Kenya along Lake Turkana. I teamed up with other overlanders and had them carry extra fuel for me in exchange for chicken curry. Once in Kenya, I took a long break to do research for a distance masters programme in sustainable development, which I was studying for while travelling. I wanted this trip to be a transition in my life and my career. 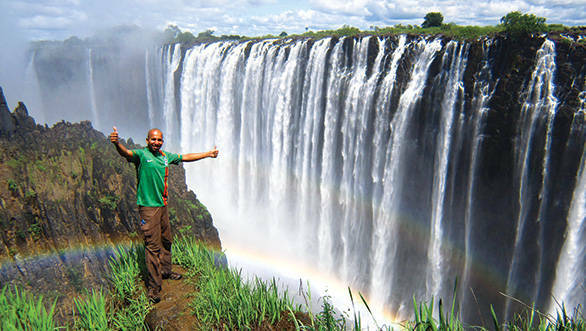 I pursued research in natural resource management and planned to put this trip experience and degree into effect once the journey was over in India. 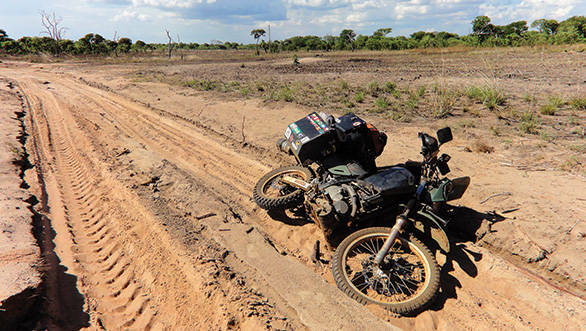 With the thesis and degree completed, I continued my journey around East Africa and from Tanzania, I rode through northern Mozambique, which has fantastic off-roading. I then headed into Zambia and visited my childhood home. From there, I had an epic experience across the deserts of Namibia with days upon days of camping under the stars and feeling small and humble in the grand landscapes that rolled into view. I made a loop around South Africa and from Cape Town, and on failing to find a sea passage to India for myself, I shipped sanDRina to Chennai and boarded a flight home. Once sanDRina landed in India, we set off on the last leg of the journey, a tour of India. 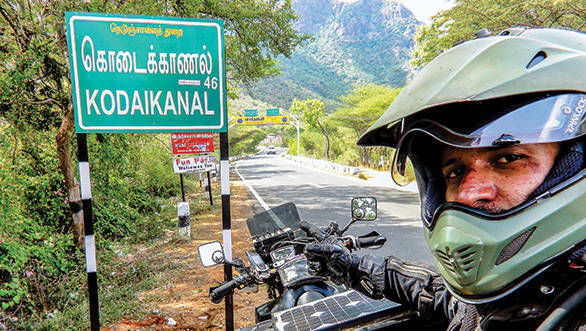 I left Chennai and went down to Kanyakumari and then came up the western coast through Kerala and Goa into Mumbai. From there, I cut across Central India and visited Khajuraho and Agra, seeing the Taj Mahal for the first time. Then I entered the Himalayas at Nainital and took backroads up into Kinnaur Valley and then rode the fabled Manali-Leh Highway, the epic finale of my journey. I rode into New Delhi in early June and finished the trip at India Gate. It's been a wonderful three years and three months and more than 1,00,000km on the road and I'm so thrilled that I could pull it off. I met so many people who have reassured me of the general goodness of humankind; a feeling that is lost sometimes by our fast-moving globalised culture. I saw vast wildernesses where the only human touch was the dirt track that I rode on. My life on sanDRina has been all that I dreamed of, and much more, and I hope that my story will encourage others to pursue their own dreams. Ride on!